GrowRings are ideal for harvesting herbs and vegetables from the smallest garden or allotment corner. The beds are circular but can be simply creased and bent to form semicircles, quadrants and other shapes. They can be used to include garden obstructions like utility poles or even to grow crops above seldom used manholes. Gardeners originally planted in ridges because it was efficient to dig in lines with a sharp stick and later a spade and later still with machinery. Vegetables don’t grow in straight lines naturally and growing plants in containers no longer requires row planting of crops. It is uncomfortable to reach to ground level while shuffling ones feet forwards to pull further away weeds. Deep reaching is very hard on backs and over-stretches seldom used muscles. The GrowRing design utilises space that the average person can work comfortably without overreaching or foot movement. Circular beds allow for toe space, enabling the user to reach and weed further into the bed. This is not possible with traditional rectangular beds. Standing with spread feet and bending within ones comfort zone, the circular sweep of an arm defines the comfortable reach area for planting and weeding. 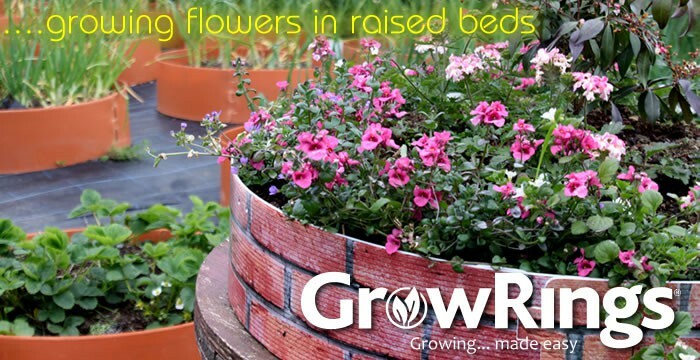 GrowRings can be laid out in circles of three, four or five foot diameter to give the best growing area and soil depth value for money of any raised bed system and allows Gardeners to plant and harvest their veg and herbs with the utmost convenience. The beds are available in plain terracotta or in a variety of printed finishes. Use a good quality multi-purpose compost mixed three or four parts soil to one of compost. For spring planting (January to April) use a greenhouse or sow seeds indoors on a windowsill in a tray of moist soil or compost. When the seedlings are 2.5 inches high transfer them to 3 inch pots with a teaspoon or plant them directly into the GrowRing after frosts have finished. Plants need regular watering, some manure or fertiliser and need to be kept reasonably free of weeds and pests, particularly slugs. In SPRINGTIME try our mini green house to start off plants and seedlings. Later… Plant Carrots. When the carrot fronds reach the roof remove the lids and top but leave the sides on to protect from carrot fly. If using on a Patio use a 1m x 1m sheet of weed fabric inside to trap soil. If the Growring is on Grass use 4 inches of bark chippings around the edge to suppress grass growth. Treat the top 2 inches of the rings with slug repellent. Leave enough space between rings for you and your wheelbarrow. A minute a week keeps weed’s away, no need for wellies! IN AUTUMN, lift the rings up like a sand castle, dig the soil up into a cone and add manure. Save Energy… only dig the soil you’re growing in. Drop the ring back over the cone, spread out the soil & cover with weed mat to block weeds until spring. Cabbage: Sow a few seeds indoors in 3 inch pots from March to May. As seedlings grow thin them out to a single plant per pot. Plant out your seedlings 16 inches apart in your GrowRing from May to July. Shelter from wind. Carrots: From March to June sow seeds thinly in circular grooves ¾ of an inch deep in your GrowRing and cover with soil. Thin out the seedlings to one plant per inch when the plants have grown 2 inches high. Garlic: Plant cloves 1.5 inches deep in soil 6 inches apart thin end up from October to March. Lettuce: Sow a few seeds from February onwards every couple of weeks to ensure a steady supply. From April onwards plant out seedlings to GrowRings 8 inches apart. Onions: Plant out sets (small bulbs) in GrowRing 6 inches apart from October through to April. Peas: Sow peas from February to July in a circle 2 inches apart around the GrowRing. Protect seedlings in February and March from frost. Peas climb 3 ft high. You will need to make a frame from canes and wire mesh for the peas to climb on. Potatoes: Plant spuds eye up 2 inches deep and 8 inches apart in an overall soil depth of 4 inches in the GrowRing from March to May. Add soil as the plants develop, and if you wish to increase the bed height insert additional GrowRings. Runner Beans: Sow beans from April to June 1 inch deep and 6 inches apart in a circle around the GrowRing. Beans climb so you will need to make a wigwam with 5ft canes for them to grow up. Radish: Sow seeds half an inch deep in the GrowRing from May to July and thin out seedlings to 4 inches apart. Strawberries: Plant dormant, bare-root strawberry plants 18 inches apart in a sunny position. Keep the soil moist and pinch off all flowers until midsummer for the first season to encourage strong root and top growth. Herbs should be grown in a sunny spot within a convenient distance of the kitchen. For best results we recommend that you use John Innis potting compost No. 1. It is best not to over fertilise herbs after they have become established as this may affect the quality of the flavour. Basil: Plant out in mid May. The plant will grow to a height of about two ft. Pinch out the tops when young to make them bushy. Chives: Plant bulbs 6 inches apart in March. Although chives are perennial the leaves will die down in the winter and re-grow in the spring. They should be lifted and divided every 2-3 years to ensure good health. Fennel: Grow from seedlings in late march and place fifteen inches apart. They will eventually mature into large decorative clumps about 4 to 6 ft high. Please be aware that they will cause considerable shading. Mint: Grow in a moisture retentive soil. Mint spreads out readily so place it in a separate pot set into the GrowRings. Parsley: Sow in March, late May and August to give a year round supply. Rich, moisture retentive soil is the best to use. Don’t allow the soil to dry at out any stage! – Cut out all flower stalks. Rosemary: Plant out in April for best results. One plant should be sufficient for any family. It produces an evergreen bush up to 5ft. (1.5m) in height. It is very easy to propagate from cuttings or to grow from seed. Sage: Plant out after frosts have finished. The plants will eventually grow to 2ft and will benefit from being clipped after flowering to reduce their height by half. Clumps should be lifted every 3 or 4 years. Thyme: Thyme is an ideal plant for a sun baked spot in the garden. Plant out after frosts have finished. Plants will grow to a height of 9 to 12 inches (23-30cm) and should be cut back to the ground or lifted and replanted every three years in spring.